MISSION, KS--(Marketwired - Jun 9, 2016) - (Family Features) Outdoor cooking is one of the highlights of the summer season, right up there with long days spent at the beach. 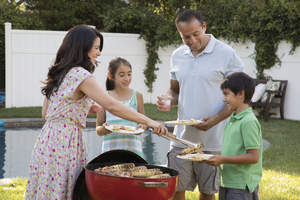 Not only is grilling perfect for entertaining and socializing, but it also provides an ideal way to get out of the kitchen during the hot summer months. However, before you fire up the grill for the first time this season, there is some simple prep work you can do that will ensure you get the perfect sear every time. First, if you are using a charcoal grill, be sure to empty any ash left over in the bottom from last year into a container and put it in the trash. Ash buildup can obstruct the grill's vents and make it difficult to control the temperature. Next, you'll want to clean the grill grates and make sure that any rust or food residue from the last use are removed. To get your grill as clean as new, rely on a flexible, disposable cleaning pad such as Clorox ScrubSingles Kitchen Pads, which come preloaded with Clorox cleaner. Finally, be sure to pre-heat the grill before you begin to cook. A simple but often-overlooked step, pre-heating ensures that food will not stick to the grill grates. For extra protection against a sticky situation, wad up a paper towel, dip it in cooking oil and use tongs to wipe the oil-coated paper towel all over the grates. After the last burger has been eaten and the last lawn game has been won, be sure your tongs and other grilling tools are ready to go for next time by cleaning them with Clorox ScrubSingles. Cleaning your tools after each use will keep them in great shape for a summer full of cookouts. Learn more tricks and tips for outdoor clean up and backyard maintenance at Clorox.com.